A year ago today I published the following story—a family favorite—on my blog. my husband and my cat. We have many Marys in our home. Perhaps unnerving to the casual visitor, there is a life-sized statue of Maria Rosa Mystica in our sitting room. She is lovely and was a gift from my mom & dad that I treasure. Over the mantle in our family room is a framed image of the Holy Family: inspiration to the many wrestling children and DVD-viewers that tumble through that room. By the kitchen sink is a small porcelain statue: my kitchen madonna. And finally, in our bedroom, home base for evening prayer, the daily read-aloud and many quiet (ha) moments of folding laundry, is my statue of Our Lady of Fatima. We really do like Mary around here. The Cathedral was full-to-bursting with hundreds of little Catholic school kids from all over the Twin Cities and beyond. Every last uniformed one of them had assembled to pray, sing, and peer curiously at the mystical, miraculous presence at the front of the church. To their dismay, none of my other children saw this. 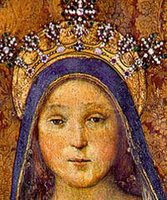 The story, though, is retold often—especially on these beautiful Marian feasts when we are reminded of the power of her intercession, and of her love. So what’d ya think? Pretty cool, huh? To tell you the truth, though, as incredible (for us) as this miracle was, I find myself taking it—and Mary—for granted. She is ever so willing to bless my little homeschool, if only I ask her blessing. So strange that I happened upon your site today. I often don’t get the chance to daily check all of “my blogs”, but somehow I did today. And so glad! Thanks for the inspiration. Oh, and thank you also for the wonderful article in this month’s Faith & Family. Just wonderful!! Amazing story. My eyes welled up with tears as I read it. I saw your blog for the first time today (my friend, Ruth, from 4Real Learning showed it to me) and I really like it! I’m trying to build a blog of my own (we have a few miracles of our own I’d like to share) and I was wondering if it wouldn’t be too much trouble for you to share with me how you made the pages with blogger. My grandfather never told anyone else in the family except his wife and my mom that when he was a young man, he was granted a private vision of Mary floating on the horizon in front of him. It inspired a life long devotion to Our Lady. I’ll bet she has big plans for your big guy. Thank you for re-sharing and recycling your story!What an absolutely beuatiful and miraculous moment all by itself. But to be able to share it with your son is just incredible. What a blessing! Margaret that is an incredible story! I have chills just thinking about it! I’m sure Mary will help you get to Mass today! Prayers headed your way. Perhaps your oldest is destined for the priesthood. Pray hard, Mary works in amazing ways here on earth. You and your son are so blessed to have had this experience. May God Bless your family. That’s awesome! And its good to know someone else has statues all over their home. They are a constant reminder and comfort. And yes, some of them are too big for the house. But so what! God Bless you and your family. These are the best days of your life. Margret!!! I read this post last night when you first posted it ’cause it showed up on my Google Reader. And then TODAY I was on Spirit Daily and guess what!?!? A link to your post is on their front page!! Cool! How lovely, Margaret! Thanks for sharing that beautiful story! I thought of this beautiful story this morning as I was loading the dishwasher. It made me remember how much Mary watches over us, in such a maternal way. How awesome is that? Hope you made it to Mass. Any story that has to do with the Blessed Mother of God is always awesome….Keep praying the rosary. Visitor from Spirit Daily. Not a miracle, but my little Mary story. Recently they built a Mosque on the main street of our little town. After blowing my top for a few weeks, I decided to do something about it. So now, when I have to drive by it to get to work (which is pretty much 5 days a week), I say a little “Hail Mary” (and pray a little louder when I get to the Sacred Name of Jesus). I imagine her little feet are perched just above the crescent moon on their spires, and that she is raining down blessings on all the little Moslems inside. Last month I read Michael Brown’s Spirit Daily remarks (again!) about wearing the brown cloth scapular. I had researched Pius X’s authority for the medal and was satisfied that it was approved. I asked myself “I wonder what the Blessed Mother thinks?” In the next day’s mail was a brown scapular addressed to me from an unknown source. Amen. I must be honest. These stories make me jelous ! Maybe that is why she dosen”t smile at me. HUH ! What a wonderful story! It reminded me of another wonderful experience a few years ago here in Texas. At St. John Neumann Parish in Lubbock, TX they have wonderful celebrations on the Feast of the Assumption. There is a history of the scent of roses and a priest and some parishoners receiving messages from Mother Mary. A few years ago while visiting there on Aug. 15 I was talking to a woman who had been there all day. As we were sharing our thoughts about the day, she offered to show me a poloroid picture of our Blessed Mother, which she had taken earlier that day. I myself had been praying before that same statue earlier. The statue shows Mother Mary looking down in a peaceful gaze with her arms also down with her palms up, as she is portrayed in some images. The picture she showed me was the same image of Blessed Mother, but she was looking straight up as if she had just looked up the moment the picture was snapped. It was so special and the woman told me many others had experienced other similar miracles. Just goes to show–Mother is always around us and taking care of us and just wants to let us know she’s here and that she loves us! Margaret, saw your link over at SpiritDaily. My grandson, when he was between 3 and 4 years of age – several times while he and his mother were walking up to communion, he would point to the altar and say “look mommy, look at all the angels”. At another time, he pointed to the right of the altar and said “look mommy, there’s Jesus”, and my daughter said, no Nathan, that is not Jesus – and he said “oh yes mommy, Jesus is standing right over there and He is crying mommy”. Children often see what we don’t – but I never go to Mass now without knowing that the Holy Angels and Jesus is right there. Margaret, I LOVED this story!! How awesome, in the true sense of the word.